Originally designed for Hollywood’s elite colourists, DaVinci Resolve has been used on more feature films and TV shows than anything else because it lets you create images that are simply impossible with other tools. DaVinci is also the world’s fastest growing and most advanced editing software. Now, with DaVinci Resolve 14, you get incredible new Fairlight audio tools specifically designed for film and television post production. It’s like getting 3 high end applications in one. All it takes is a single click to switch between editing, colour correcting, audio mastering and delivery. Best of all, if you’re collaborating on a team, you can all work on the same project at the same time. DaVinci Resolve 14 is a revolution in post production. Incredible speed, professional Fairlight audio, revolutionary collaboration and more. DaVinci Resolve 14 has hundreds of new features for editors, colourists and now, for the first time, audio professionals. The new playback engine dramatically increases responsiveness with up to 10x better performance for editors. You also get a whole new page with the full Fairlight audio post production tools that let you record, edit, mix, sweeten and master sound with full 3D audio space and up to 1000 channels. Colourists will find amazing new filters that include automatic facial recognition and tracking for quickly smoothing skin tones, brightening eyes, changing lip colour and more. 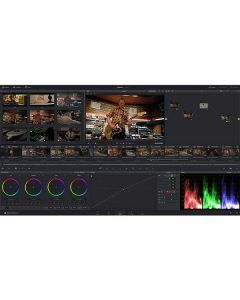 Plus, DaVinci Resolve 14 features revolutionary new multi user collaboration tools such as bin locking, chat and timeline merging that allow editors, colourists, and sound editors to all work on the same project at the same time. All these new features make DaVinci Resolve 14 is the world’s most advanced post production software. New professional tools for audio post production. DaVinci Resolve now includes fully featured Fairlight audio in the same software you use for editing and colour correction. You get high end mixing for up to 1,000 channels in real time, plus support for massive Fairlight audio consoles. It’s a true end to end workflow that supports recording and ADR, sound editing, sound effects, sweetening and mixing. You can even mix down and master to multiple formats, including 3D audio space formats such as 5.1, 7.1 and even 22.2. Create up to 1,000 audio tracks with 8 main, sub and aux outputs. Add Fairlight Audio Accelerator zero latency realtime performance. Edit clips at up to 192kHz and 24-bit with automation for adjusting fade, levels and more, all the way down to individual audio samples. Full professional mixer with input selection, effects, insert, EQ and dynamic graphs, output selection, aux, pan, main and submix selections, and more. Add 3rd party VST plug ins for even more creative options. You can get real time processing performance for up to 6 plug ins per track. All the tools you need for mastering. Deliver anything from mono up to stereo, 5.1, 7.1, Dolby and even 22.2, complete with full 3D panning. DaVinci Resolve 14 makes importing, syncing and organizing footage fast. Whether you’re going out to the web, tape, or theatrical distribution, DaVinci Resolve features everything you need to deliver projects in virtually any format. You’ll be able to get to work quickly and output files fast, so you’ll never miss a deadline. Use the media page to import footage, sync audio and prep it for editing. Simply drag and drop files from your storage into bins or even your timeline. Create free form or metadata based smart bins to organize clips. You get customizable list views, multiple bin windows and more. Use embedded metadata or add your own to sort and sync clips, change display names, detect starts and stops in Multicam angles, and much more. Output to the web, round trip projects and media with other applications, or even create digital cinema packages for theatrical distribution. Quickly add multiple jobs to the render queue for batch processing. You can even offload output to another workstation. DaVinci Resolve give you native compatibility with virtually all major post production file types, formats and even other applications. Revolutionary new tools allow simultaneous editing, colour correction and audio post. DaVinci Resolve 14 completely redefines post production workflows. Assistant editors can prepare footage while editors cut the picture, colourists grade the shots, and sound editors mix and finish audio, all in the same project at the same time. You no longer have to waste time conforming and you no longer have to wait for a locked edit before starting colour and audio work. That means picture editors, colourists, and sound editors can now work in parallel, leaving more time for everyone to be creative. The integrated chat client lets you speak with other members of the team without ever having to leave DaVinci Resolve so you can all stay on the same page. The visual timeline comparison tool makes it fast and easy to see differences between two timelines so you can accept and merge changes. DaVinci Resolve 14 features an incredible new video playback engine with CPU and GPU optimizations, fast 16-bit float playback, lower latency, faster UI refresh, support for Apple Metal, and more. These upgrades combine to make DaVinci Resolve faster and far more responsive than ever. Working on long timelines with thousands of clips is incredibly fluid and editing is even more precise. Scrubbing and playback are instant, often starting before you lift your fingers off the keyboard. Powerful acceleration for processor intensive formats, like H.264, makes it possible to edit 4K material on a laptop in realtime. Whether you’re working in HD or 4K, with ProRes, H.264 or even RAW images, DaVinci Resolve 14 is completely responsive and fast enough to keep up with your every move. DaVinci Resolve’s Emmy™ award-winning image processing technology features deep 32-bit float processing combined with unique, patented YRGB colour science that processes luminance independent of colour. This allows you to adjust the luminance of video without rebalancing the colour of your highlights, midtones, or shadows. The massive internal colour space is perfect for the latest HDR and wide colour gamut workflows, and lets you generate looks that are simply impossible to create on other systems. When you have a client looking over your shoulder you need to work fast. DaVinci Resolve control panels are designed to give you fluid, hands-on control over multiple parameters at the same time, allowing you to create looks that are simply impossible with a standard mouse. All controls are logically placed near your natural hand positions and are made out of the highest quality materials. You get smooth, high resolution weighted trackballs, along with precision engineered knobs and dials that feature the perfect amount of resistance so you can accurately adjust any setting. DaVinci Resolve control panels let you instinctively touch every part of the image. Fairlight mixing consoles provide high quality tactile controls for nearly every parameter and feature in the software. Unique user interfaces and fast to use buttons and controls allow quick mapping of the console keys into a configuration that is optimized for the task at hand, allowing you to work faster with Fairlight audio than any other tool in the world. Desktop and free standing consoles are available in a variety of configurations to meet the needs of your facility. DaVinci Resolve runs on all major platforms so you can use it at home or in a post facility on a Mac, at a broadcast facility running Windows, or a VFX studio on Linux. This gives you the freedom to use the platform of your choice, making it easy to integrate with your existing systems and workflows. If you’re running Red Hat or CentOS Linux, you can even build your own workstation using low cost motherboards, extremely fast processors, massive amounts of RAM and up to 8 GPUs. Imagine building your own super computer for incredible real time performance.